I am asked often enough what gear I use, so here is a list of my gear: Cameras, lenses, tripods, mounts, audio mics and recorders, wetsuits, paddles, impact vest, flotation, radios, surfboards, foil, and more. If there is anything I am forgetting or that you want to know about please contact me and let me know. On my DIY bamboo pole mounts I use a small waterproof action camera. I upgrade this camera every time they release a new one, the improvements in image quality, features, and size and weight are well worth it to me. Most if not all of my videos use this camera, often it is the one camera that I grab first and use most. I really appreciate the ease of having a small housing-free waterproof camera that I can pull out of my pocket and record any water shot with one push of a button. There is a saying the best camera is the one I have with me. This amazing superzoom camera has the quality I need in a package that is easy to bring with me everywhere I go. I use this camera much more often than my DSLR cameras and big heavy lenses. A good all in one camera allows me to capture just about any shot I see, quickly, and discreetly if need be. When I have the time and need the best image quality I grab a Canon L lens and a DSLR camera. Continuous autofocus for video has come a long way, and in my testing Canon dual pixel focus technology is the best. As much as I love the image quality of prime lenses I often find myself in a tight spot and in need of a zoom lens. Currently for video I most often use a Canon 80D, 100-400 zoom lens, and 24-105 zoom lens. For time lapse videos I use a manual lens with an adapter. I can usually repair most images or videos if I make a mistake or miss the shot. With audio this often seems impossible, our ears hear every distortion and even the tiniest gap is noticed. I have been fortunate to record in a broadcast radio station and learn about audio recording and live on air broadcasts. Out in the field I am more causal with audio recording and often use the onboard camera mic, knowing that I will most likely replace the audio. Dealing with separate mic batteries is an inconvenience so I usually grab this camera powered mic when traveling. For voice overs and interviews I use this mic. When I need lavaliere mics I use one of these xlr mics. Different brands of mics often have different quirks and gain levels and so it seems do audio recorders. I use this recorder most often. When I need to record more than a few mics I use this larger audio recorder. Video of interviews was or is a challenge given the sometimes long recording times. An affordable solution is Panasonic’s micro 4/3 cameras: unlimited recording time and ac power plugs work great for me, and no overheating. I love all of the affordable lenses in used and new condition with readily available adapters, I enjoy treasure hunting for these old manual lenses. As great as modern digital lenses are, manual lenses are flicker free and often much easier to use for time lapse video. Tripods and camera mounts can be easily overlooked, until I don’t have the one I need. When I was making this video and using a long 1800mm lens I needed extra support and went with a wood tripod from Ries, beautiful craftsmanship. I love Manfrotto for every day use, I have had the same tripods for years and they have held up great. These magic arms are amazing and have helped me record in all kinds of awkward and challenging environments. Since I have made the transition to SUP surfing I need less rubber. So instead of my usual custom 5 mm Axxe suits I have been wearing pre-made 2-4 mm. Patagonia wetsuits have been warm enough, fit well and comfortably, and are durable. I am tall with long limbs and generate enough leverage that I have broken several paddles. So I ended up with a unbreakable ultra stiff paddle, to stiff so I sold it. The paddle I have now has been very durable and a great all around paddle with enough flex and the smaller blade size I like. The shaft is a blend version, it feels light enough and yet stronger than a lot of the full carbon paddles I have paddled. I have had it for a couple years now and still love it, very durable. It’s been great in overhead beach break and nuking downwinders. Best paddle I have tried! Last year I started wearing an impact/flotation vest. Sizing was a bit of challenge as the ones that fit under my westuit were to tight and uncomfortable. Then when I wore a vest over a wetsuit it was a problem in a wipeout, as the vest was lifted over my head, was disorienting, and precious seconds were spent putting the vest back in place. A couple solutions are to wear an impact suit, or up-size to a larger wetsuit so that the impact vest fits underneath. On downwinders I either wear my impact vest, or a PFD that gives my arms the freedom to paddle. Downwinders I also carry a radio and lend a buddy one when we are any distance from shore. A floating submersible radio makes the most sense for me. If I was doing a long distance downwinder I would carry a spare paddle. I also carry a whistle. I have 2 leash plugs and double check my leash for any signs of wear or potential failure. If I was doing something extreme or isolated I would carry a waterproof flare and signal device. Anything over a couple miles and I carry a hydration pack. In winter the waves are steeper, hollower, and more powerful. 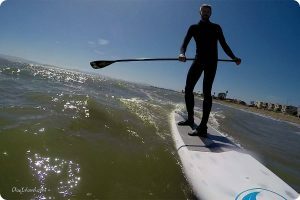 I ride a Stretch SUP with a more pulled in outline, more rocker, and bit more volume for stability in the offshore winds. My current winter board is Stretch Buzz SUP model 9′ 6″ x 31″ x 4″ with 140L of volume. Great board and I love riding it at Ocean Beach. Summertime the waves are often either soft and crumbly, or peeling smoking fast down the line. For both of these types of waves a simmons shape works the best for me. Kirk makes his L41 brand of surfboards at the Stretch factory. I have been fortunate to pick up 2 used Simsups at a great price and in great condition. The first simsup I bought is a custom S3 8’8″ x 32″ x 4 3/8″ with 140L of volume. The second simsup is a custom ST model 8’4″ x 31″ x 4 1/2″ and 136L of volume. I demoed many many downwind boards before I found one I really enjoy. The downwind scene in the SF bay area is still new and growing. No shapers that I know of are making downwind boards in our area. Bluerush in Sausalito was selling Blue Planet boards. I discovered that I was faster, caught more glides, and had more fun on a wider board. I have their 14′ x 30″ carbon bumprider. Foil surfing is super popular lately and for good reason. One of if not the most intense wave riding experiences I have had yet. Opens up a whole new territory for wave riding, and makes small waves really fun. There are a variety of foil spots in my area so I have a quiver of foils and wings and boards. Is there anything missing or that we need to ad to this list? Is this page helpful? Please help us continue to offer this content for free and to everyone. Become a supporter and send us whatever money you can afford. Thank you! Help us create more pages like this by becoming a patron.